Editor’s Note: This story is being shared with us by Gangs Across America, an online source providing strategies to combat gangs across the nation. From time to time, Corrections.com will publish articles from the Gangs Across America website. As a gang investigator and a criminal justice professional for nearly thirty-nine years, I have seen and heard most everything regarding gangs, and am looking forward to seeing something completely out of the ordinary as the learning process continues. As police officers, correctional officers, or whatever your chosen profession, we dictate our thoughts and our opinions by definitions. Growing up on the South Side of Chicago, Illinois in the 50’s and 60’s, I saw neighborhood gangs like the Delvikings, Apaches, and Deacons control their neighborhood “turf” the very same way as gangs of today. These neighborhood gangs became part of a larger gang culture called Disciples and Stones, and eventually even larger into Gangster and Black Disciples and Black P Stone Nation. The very same thing occurred in Los Angeles, California with the Slausons and the “Piru Boys,” who later became Crips and Bloods. In the Washington, DC/Prince George’s County (MD) area, neighborhood gangs like the Palmer Park Crew have transformed into Bloods, either through street consumption, or jail and prison recruitment. If one focuses on definition, many in the DC area do not think a crew is a gang. Well that is the farthest from the truth. Here we go with that definition thing again. Old Webster defines a “crew” as a group of people associating together in a common act, or by common traits or interests; or a band or force of armed men. When crews like the Brightseat Road Crew conduct a drive-by shooting reminiscent of the days of Al Capone where multiple vehicles open fire on a crowd of people with these vehicles coming from two different directions; when members of the Ardmore “Goons” opened fire several blocks from a high school, shooting from an open window in a car, hitting three people killing a seventeen year old female and senior in high school, what is the difference between neighborhood gangs or national gangs? Graffiti is no different. 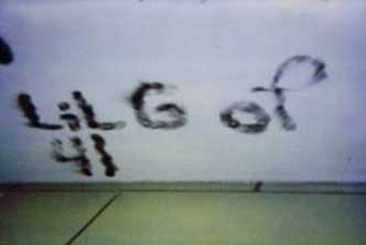 The example of “L’il G” of 41 tells us the same thing. It is intimidation. If you interpret 41, they are called the “41 Mob.” Once again, when you look at definitions, the word mob means a large or disorderly crowd, or a criminal set. Wow! A mob is defined as a gang. 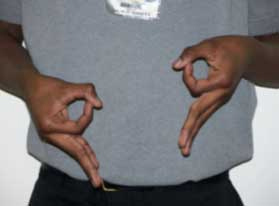 These neighborhood gangs also have hand signs like the National gangs. For instance, the Palmer Park Crew. Look closely, they look like a National gang we know a lot about; Bloods! We are a nation of definitions. Let’s stop and think and not form our own opinions without looking into the reality of what is staring us in the face. We all know the “ostrich” effect. There are too many heads in the sand; it is too hard to breathe. By the way definition is a statement expressing the essential nature of something. Even the definition of “definition” is too complex.